In times of old or at least in my Gran's day, who experienced rationing of the second world war and practiced the motto waste does not want not. My gran seldom wasted food, as so many of her generation did, the food was far from the bargain commercial commodity it is today. She would go shopping nearly every day to purchase just enough for dinner for all the family rather than go to the supermarket and by excessive quantities. Leftover food was cleverly recycled into tomorrow’s night casserole or hotpot and ate leaving a morsel of waste. In comparison to my generation who simply throw away any leftovers into the bin. I even remember my manager, when I worked for an order of Nuns’. She was 86 years old, and always disgusted at the amount of food wastage, regularly commenting on the number of people starving in the world. I had to agree with her, especially when the average households produces 50% food waste and produce 7 million tonnes of food wastage every year, and most of it's still reasonable to eat. The most common food thrown out is fresh fruit & veg and bakery items such as cakes, bread, etc. that often aren’t consumed in time or far too much food has been used. 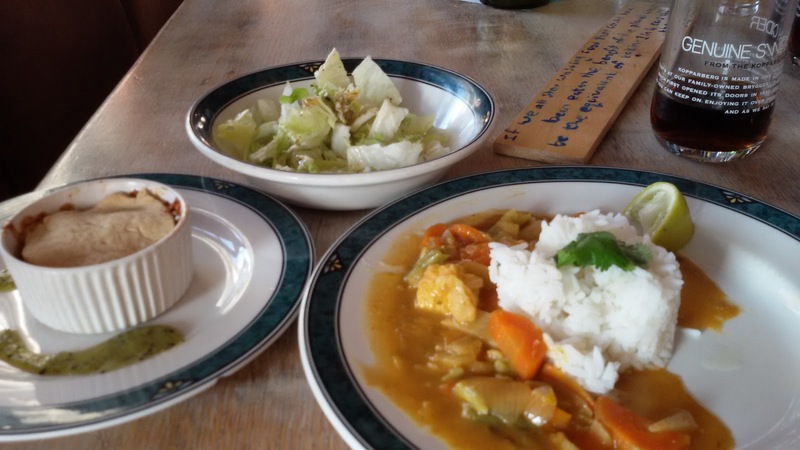 (lovefoodhatewaste 2015). In the media, supermarkets have come under scrutiny from the media unnecessary disposal of food and the zealous best of dates where food has still been safe to consume. The negative media attention has caused embarrassment and shame to the supermarket, highlighted by journalists dumpster diving, finding vast quantities of eatable food thrown out. 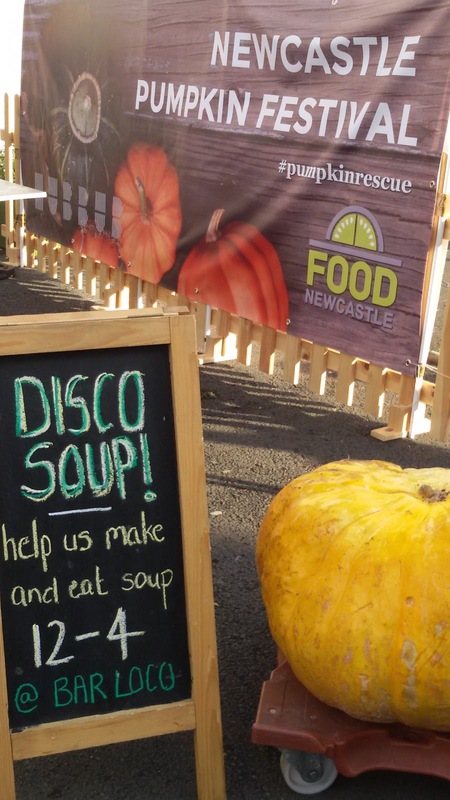 Many supermarkets are working with local charities to assist in redistributing food preventing it going to waste. Through the world, there has been freegan movement to live for free on societies leftovers that otherwise end up in the landfill. Part this movement has seen local communities starting initiatives to create pop-up cafes or events that use the waste the food. 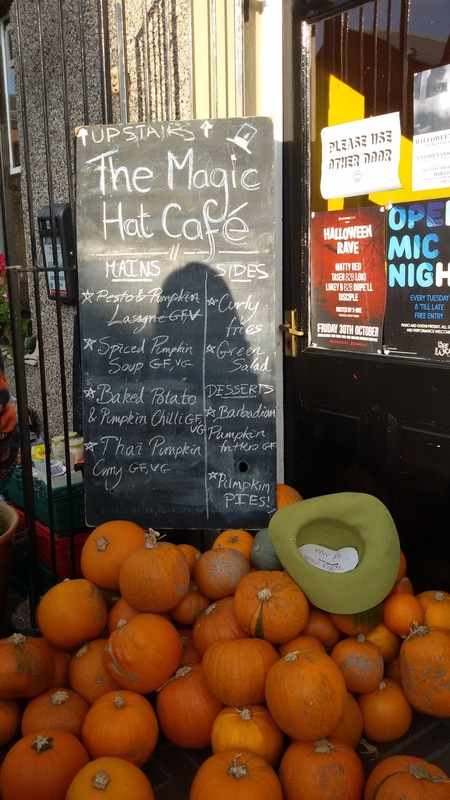 A local event is the Magic Cat Café is pop up café relies on the assistance of volunteers to provide nutritious and delicious meals upcycled from food intercepted from the landfill. The cafe adopts an unusual payment method of pay as you feel, pay via money, or sometimes offering services and other talents. Keeping with the Halloween theme, the cafe had salvaged numerous of editable pumpkins from the bin. The menu consisted of a variety of pumpkin dishes into the menu with pumpkin soup, Thai pumpkin curry, pumpkin lasagne and an array of delicious pumpkin desserts. At the entrance, the was a pile of pumpkins that the volunteers cordially encouraged to take on the condition they go to a good home. My pumpkin ended up as pumpkin soup that ended up a disaster but remedied by water, salt and coriander. The volunteer like always showed their friendly selves and passion for the cause, bringing all members of the community together. I ended up having a good chat with one of the volunteers. On the serving table were menus suggesting how to use the pumpkins. 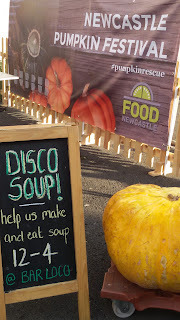 The volunteers were hard at work at the entrance making soup; they had an efficient system with one area for preparing and chopping pumpkins, another cooking and serving the soup. 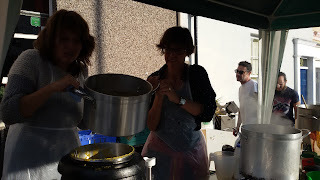 There was a vast quantity of soup served, so the volunteer were encouragingly tempting patrons to try it. 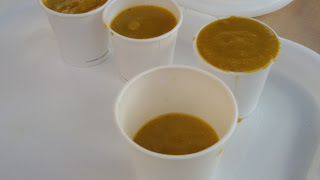 The soup was amazing, it had a thick consistency and rich, spicy taste of black pepper and coriander, I wish I go more. Originally, I ordered a pumpkin lasagne sadly; none was left, so I chose the Thai pumpkin curry and pumpkin pie, mixed with apple and cinnamon and kiwi zest. This is such a great idea! Food waste makes me sad and angry! Not just what supermarkets throw out but the fruit and vegetables that never even make it there as they are not normal enough looking, for instance potatoes that are all lumpy and odd shaped, not the perfect spheres you see in supermarkets, and so they think that consumers are too stupid to buy them! I hate food wastage, especially when people buy far too much and they end up throwing it out. I totally agree with you about the idea of perfectly editable food it's thrown out because it doesn't conform to a certain shape. I love the idea of this cafe as it's tries to prevent food wastage. This is very interesting. We also hate wasting food and just watched a TV program about Swedes who live like this, going dumpster diving every night or so. We do throw away too much food. On the other hand, many Swedish supermarkets were recently chastised for re-labelling and re-selling old meat, which is just gross. I am really impressed by this best post. Cooking need of us and we should view this assignment writing to take the many more recipe of food. We can also make the soup in home easily. That's cool! In my experience volunteers always do better than employees (god knows why). I once visited a culinary event in the end of which guests were asked to leave reviews on Essaybox on how they liked the experience. This was the best time I ever had!